Molenplas is a nice family home at the edge of Haarlem; it features a garden with a great view of the Poelbroek park nature reserve. The house is located about 9 km from the beach and sea and 4 km from the centre of Haarlem. An ideal starting point to explore the area by bike. On the ground floor the house has a large living and dining room with also an open kitchen. From the living room you can step right into the garden and enjoy the beautiful view over Poelbroek park. On the first floor you'll find 3 bedrooms and a large bathroom. On the top floor is the third bedroom with a double bed and an adjacent large terrace. 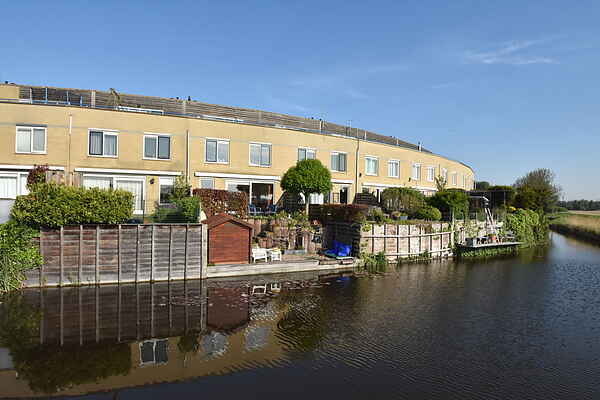 The house is an ideal starting point to explore the coastal region, Haarlem area and Amsterdam. De Molenplas is around the corner, the bus to Schiphol stops around the corner and you can park for free. By bike you can discover wonderful roads through the dunes and cycle to the beach this way. PLEASE NOTE: 2 cats will be staying behind in the house; they need to be taken care of (food, water, letting them inside in the evening). The cats are very friendly and adorable and can possibly be cared for by a neighbour during your stay. This house is so nice because it is spacious en light, the whole day through. De wide vieuw to the countryside can be experienced immediately due to the 6 meter windows. By opening the sliding doors, one feels you are outside and it is always quiet here. And that while the citycentre is close by and easy accesible with our available bicycles, as well as the dunes and the beach.